You must make reservations at least 5 minutes in advance of the time at Wa Teppan & Sushi Bar - Santa Fe. Wa Teppan is a Japanese restaurant that offers tables with teppanyaki. In addition to teppanyaki the restaurant offers a wide selection of sushi and sakes. The atmosphere is casual and modern. Wa Teppan es un restaurante japonés con mesas de teppanyaki y ofrece una gran variedad de sushis y sakes. El ambiente es casual y moderno y ofrece una terraza bar. Scallops​ sealed salmon with sliced jalapeno and yuzu sauce mirror. Scallops, octopus, kanikama, fresh salmon and tuna with coconut milk, water chestnut and cucumber in ponzu sauce. Octopus, scallops, shrimp, sea bass and cherry tomato citrus sauce. Calamara crab pasta filling, topped with eel sauce. Motoyaki marinated tuna with salsa on crispy puffed rice. Fresh salmon roll stuffed fish pate on mango and avocado salsa. Sheets of tuna and avocado on sour sauce on a bed of rice with a touch of spice. Made​ with flour tortilla, tuna or salmon, sweet sauce, cherry tomato and jalapeno masago. Seared tuna and shaved, with carrots, jicama, cucumber and avocado to the center. Sealing tuna gourmet lettuce, grape seed oil and rice vinegar. Squid boil over paste of garlic, ginger and lemon, garnished with lettuce and kinoa gourmet sweet dressing. Lettuce and spinach topped with goat cheese, topped with ginger dressing, lemon and peanut oil. Seaweed and cucumber accompanied by a soy-based dressing and mirin. Soybeans in the pod weathered or roast. Shrimp tempura cilantro sauce on lettuce hearts. Asparagus wrapped in thin slices of rib eye teriyaki sauce imported. Rib eye rolls in crepes with sesame sauce. Clams on the half shell baked gratin with onion, masago and ponzu sauce. Chile​ water (hot) with crab stuffing red pepper dip. Spheres kanikama stuffed shrimp accompanied guava chutney. Soft shell crab accompanied by flour tortillas jalapeno sauce. Weathered crisp and light soy sauce. Soybean soup with tofu cubes and water. Miso​ soup with seafood and a touch of chipotle. Chicken and shitake mushroom with coconut cream, ginger and lemon tea. Miso​ soup with thin cut rib eye and a touch of spice. Miso soup with noodles and variety of fungi. Cream of crab with a touch of spice. Roll eel, yellow seaweed and masago and avocado with sweet sauce. And breaded shrimp roll with avocado and mango kanikama out. Spice tuna roll with avocado and chives out. Roll fried soft shell crab, masago, avocado and cream cheese. Roll roast beef with onions and peppers, seasoned with soy cheese on the outside and fresh serrano chile. Roll cream cheese, cucumber and avocado topped with sea bass, tuna and fresh salmon. Fried​ roll fresh salmon, cream cheese, pineapple and coconut crusted grainy. Roll shrimp and cream cheese with pineapple, avocado and eel sauce outside. Roll shrimp, cucumber and avocado salsa with dynamite. Anguilla, mazago, avocado and cream cheese. Roll fresh salmon, cucumber, masago and cream cheese. Roll marinated tuna tartar with crispy carrots, onions and beets. Kanikama roll, cream cheese and chiles with kakiage out. Tempura fried roll with avocado and masago and eel out. Kanikama roll manchego cheese, avocado, sea bass crusted outside and cilantro dip. 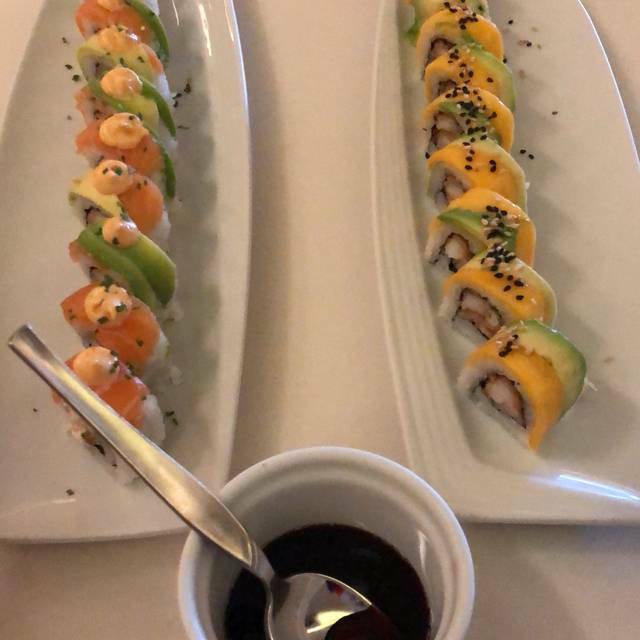 Tampio roll covered with salmon and avocado and strawberry mango sauce. Roll avocado, cucumber and scallion with hamachi, fried tempura and spice sauce out. Fried calamari roll with mango and apple spice out with dynamite sauce. Roll cream cheese, kakiagge, chiles and cucumber with slices of salmon and avocado on the outside. Roll salmon, tuna, sea bass and cucumber marinated in jalapeno sauce topped with cheese crem and black sesame. Rice​ paper roll with tomato, asparagus, avocado, panela cheese, spinach, cucumber and carrot with honey and mint. Rib eye roll with cream cheese, asparagus and avocado, and fried weathered tampico and eel sauce. Roll avocado, cucumber and chives outside, tuna tempura fried decoracon and spice sauce. Roll​ sweet carrot, cucumber, spinach, tamago, shitake mushroom and avocado, bathed in sweet sauce. Soy-based​ sauce, and olive oil with sliced jalapeno rayu. Sashimi of sea bass and avocado dip on a mirror serranito cilantro and salsa. Blades scallops with citrus sauce, jicama threads, cucumber salad and a touch of spice. Hamachi sashimi and mango sauce serranito. Mi reservación era 2 pm y no habían muchas personas en el restaurante. Los mozos se juntan en una mesa, se sientan y conversan a su modo, haciendo sentir incómodo a cualquier comensal. La comida deliciosa! Above average prices for average food, kids area is simply BAD, lack of attention to kids and very small. I would expect a much better area considering the prices paid. Buena experiencia en el Tepanyaki, la comida es rica y los costos no son justos, el ambiente es lo que mas me gusto, ya que es un lugar muy relajado y privado. Es el restaurante perfecto para ir entre semana a platicar con amigas o con el marido no hay mucha gente. The ribeye is just incredible on the teppan grill. We also enjoyed the tempura shrimp and veggie appetizer. Excelente lugar bien ambientando, buena relación precio-calidad, limpieza y servicio. Es un lugar sencillo, pero con buen gusto, la comida no es buena, con rollos muy bien ideados y preparados. Lo recomiendo para un día cualquiera en que se quiera comer comida japonesa y sin pretensiones. Los meseros estaban un poco distraídos y no estaban al pendiente, tardando en preguntar si necesitábamos algo más. El lugar y el ambiente muy bueno, todo minimalista y con buen gusto. La comida excelente.